The sixteenth book in the Poiema Poetry Series is Twisted Shapes of Light by William Jolliff. Published May 11, 2015. William Jolliff is Professor of English at George Fox University in Oregon. His previous books include the poetry chapbook Whatever Was Ripe (1998) and The Poetry of John Greenleaf Whittier (2000). He is also well known for playing bluegrass banjo in and around the Pacific Northwest. 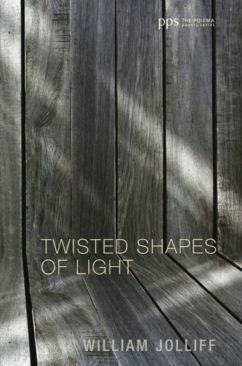 To purchase Twisted Shapes of Light visit: Wipf & Stock.